IRC Section 1035 provides exchanges into life insurance or annuity contracts with Long Term Care (LTC) riders to be income tax free and treated as LTC contracts under IRC Section 7702B(e). 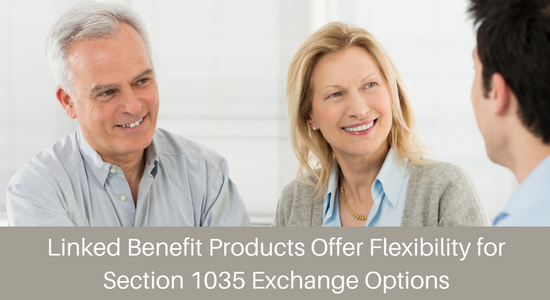 The tax free exchange provisions in Section 1035 positively impact so-called linked benefit life insurance-LTC products and linked benefit annuity-LTC products. Single deposit or flex-pay life insurance products with a LTC rider. Life insurance death benefits are income tax free. Lifetime LTC rider benefits paid on these contracts are also income tax free (IRC Section 7702B (e)), but will reduce the net life insurance death benefit to the minimum residual amount. Single deposit non-qualified deferred annuity products with a LTC rider. The full deferred annuity account value will first be reduced to zero to pay LTC benefit claims before the remaining tax free LTC rider benefit claims are paid. Lifetime LTC rider benefits will be income tax free (IRC Section 7702B (e)). Lifetime cash withdrawals from the deferred annuity will still be treated as LIFO income on gain in excess of cost basis. Death benefits will still be treated as taxable LIFO income in respect of decedent (IRD) on gain in excess of cost basis. Meaning that existing life insurance cash values can be exchanged, tax free, into a linked benefit life insurance-LTC contract (single deposit or annual flex pay). Only complete life insurance to life insurance exchanges are permitted, i.e. the old contract must cease to exist. For flex-pay exchanges, a trail of annual premiums may be paid out of pocket by the policy owner in addition to the lump sum exchange amount from the old life insurance contract. The possibility of a one for two Section 1035 life insurance to life insurance exchange also exists. In this case, a traditional UL policy without a LTC rider could be one of the new contracts and the other new contract could be a linked benefit life insurance-LTC contract (single deposit). Carryover cost basis on the exchange to the two new contracts will be allocated proportionally. This means that existing deferred annuity account values can be exchanged tax free into a linked benefit deferred annuity-LTC contract (single deposit). Since this type of exchange is considered to be an annuity to annuity exchange, partial exchanges from one annuity contract to another annuity contract are permitted under the guidance of Rev. Rul. 2003-76 and Rev. Proc. 2011-38. Carryover cost basis will be allocated proportionally between the old and new contracts. Cost basis tracking will be important for both life insurance-LTC and annuity-LTC linked benefit products. The Code provides rules for using cash value or account value of linked benefit products to pay the monthly charges (costs) for the LTC rider. These charges will be excluded from gross income and will reduce the cost basis of the insurance-LTC contract or annuity-LTC contract. However, the contract cost basis cannot fall below zero (IRC Section 72(e)(11)(A)(B)). Another significant issue concerning LTC Section 1035 exchanges is that the IRS has issued additional tax guidance for partial exchanges involving annuities and stand-alone individual LTC products. In Notice 2011-68, the IRS allowed a series of annual partial tax free exchanges from a deferred annuity contract to fund annual premiums for a stand-alone LTC contract. This method can work well administratively when both the deferred annuity contract and the stand-alone LTC contract are issued by the same carrier. Lastly, Annual Premium or Limited Pay Guaranteed Universal Life (GUL) insurance products with a qualified LTC rider are available for Section 1035 exchanges. Life insurance death benefits are income tax free. Lifetime LTC benefits paid on these contracts are also income tax free (IRC Section 7702B(e)) and reduce the death benefit dollar for dollar. BSMG life insurance, annuity, and LTC advisors can provide access to a wide variety of linked-benefit LTC, standalone LTC, and GUL-LTC type of products from our competitive carriers. Contact us today for a policy review of your client’s insurance or annuity contracts to see if a product with an LTC type of rider may provide a more flexible and more efficient combination of protection benefits.